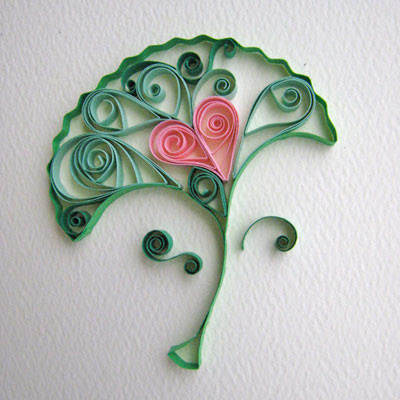 Quilling or paper filigree is an art form that involves the use of strips of paper that are rolled, shaped, and glued together to create decorative designs. The paper is wound around a quill to create a basic coil shape. The paper is then glued at the tip and the coil shaped, these shaped coils are arranged to form flowers, leaves, and various ornamental patterns similar to ironwork. "This was the perfect use of my nephew’s crimper. I crimped an entire length of paper first, then straightened out the other parts of the leaf, and left the crimped part on top undisturbed. There are 3 shades of green, going for a variegated effect. I think it adds more depth than just using the same color." All other things on this site is super, even they are not for ginkgo.